Mayslake Peabody Estate has a rich history not only in DuPage County but also the Chicago area. Francis Stuyvesant Peabody founded one of the nation’s largest coal companies in 1883 when coal furnished 90 percent of the nation’s energy. 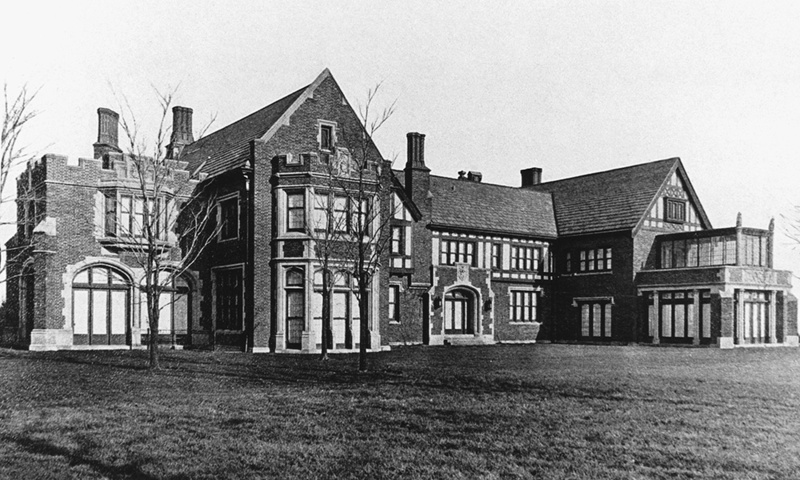 In 1918 Peabody hired renowned Chicago architect Benjamin Marshall to design a Tudor Revival-style country mansion on the site of 848-acre Mayslake Farms — named after his first wife and daughter. 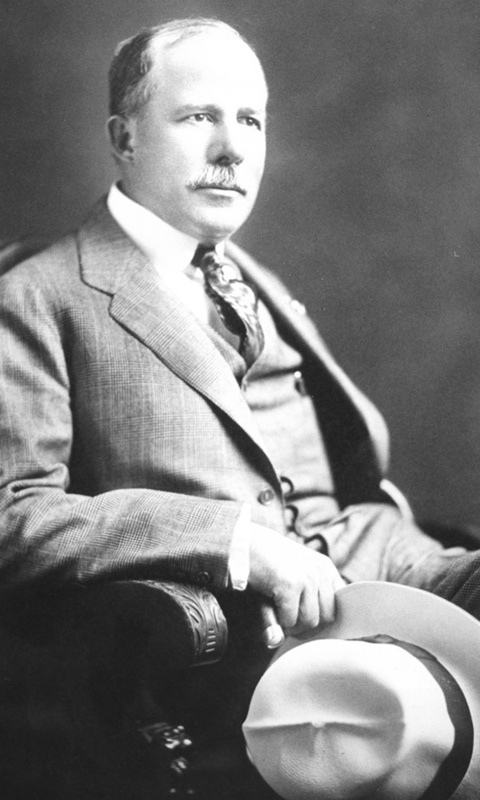 Peabody was born to an affluent and prominent family in Chicago on July 24, 1859. Peabody graduated from Yale in 1881, returned to Chicago and entered the coal industry. He married May Henderson of Utica, New York in 1887 . The couple had two children, Stuyvesant “Jack” in 1888 and May in 1891. Peabody’s first wife died while travelling with friends in 1907. Peabody married Mary Sullivan two years later at St. Patrick’s cathedral in New York City. Peabody intended Mayslake to serve as his retirement home. The mansion was completed in 1921, and the couple moved into the unfurnished home a short time later. Peabody died of a heart attack during a drag hunt on the property on August 27, 1922. Mrs. Peabody occupied the home for a little over a year, and she and the children did not want to keep the property. Son Jack sold the entire property to the Franciscan Province of the Sacred Heart, Order of Friars Minor, in 1924. Peabody’s desire for a country retreat was a common one among the well-to-do business class of his era. With a rapid increase in the number of successful capitalists during the Gilded Age between 1870 and 1900 the movement to build “country houses” came into full bloom. Illinois’ North Shore and outlying areas surrounding Chicago filled with country estates after 1900. The focal point of the house is the brick and limestone entryway featuring the Peabody coat of arms and “Murius Aereus Conscentia Sana,” Latin for “A good conscience is the best defense.” The Tudor Revival-style home contained some strikingly modern features, including a central vacuum system, plumbing system and seven electric refrigerators, one of which one even had an ice water spigot. Peabody chose Marshall & Fox Architectural Firm to design his country home. The firm set an unsurpassed standard for Chicago’s most elegant apartment buildings, theatres and opulent hotels. Their stylish Blackstone Hotel was commissioned in 1908 and won the American Institute of Architects’ medal of honor in 1910. Marshall & Fox later designed The Drake in 1919 and Edgewater Beach Hotel and Apartments in 1921. Marshall & Fox also designed many homes for the entrepreneurial elite at a time when Chicago was a rapidly growing commercial city. The firm designed more than 60 mansions and country houses in the Chicago area, and Mayslake Hall is one of their few known surviving country estates. Marshall & Fox’s work occupies an important place in Chicago architecture and demonstrates historic detail in all their designs. Early 20th-century country houses came in a wide variety of architectural styles, though most were historical revivals. This reflected the prevailing trend toward historicism, as architects looked nostalgically to the past for inspiration. Among the most favored styles was Tudor Revival. Tudor Revival houses featured: steep-pitched gabled roofs; red-brick walls with stone trim; stucco cladding; decorative half-timbering; tall, narrow windows and large, elaborate ornamental chimneys. These homes were regularly featured in the architectural journals, as well as in Country Life and Arts and Decoration. Mayslake Hall is an outstanding example of the Tudor Revival-style. Peabody and other entrepreneurs considered the English manor house the epitome of gentility and social status. Mayslake Hall is similar in appearance to Compton Wynyates, a 15th-century manor house in Warwickshire, England. The Franciscan Province of the Sacred Heart, a Catholic religious community of men now headquartered in St. Louis, was founded in central Illinois in the mid-1850s and has mainly served the Midwest throughout its history. It is a territorial province of the worldwide Franciscan Order, which has a membership of over 25,000. The Franciscans purchased the Mayslake property for $450,000 on March 28, 1924. The Franciscans spent the next year converting the mansion into a retreat house. The spacious living room was converted to a chapel, and its doors and eight windows were fitted with stained glass. In the 1950s a two-story retreat wing was connected to the house, providing an additional 112 rooms and a new chapel. The Franciscans began selling off the Mayslake property in the 1930s. The sale of property continued, including 300 acres for the Trinity Lakes and Whitehall subdivisions during the 1970s. In 1990 the Franciscans announced the pending sale of its remaining 88 acres to a Westmont real-estate developer who planned to raze its buildings and build 130 luxury homes. A public campaign to preserve the property resulted in a referendum that enabled the Forest Preserve District to acquire the parcel for $17.5 million in 1992.